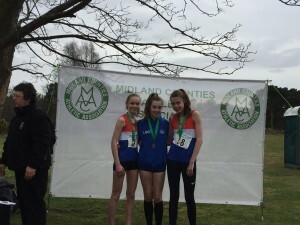 A fantastic mornings racing saw 14 Medals won by our junior athletes at the Midlands 5km Road Championships! 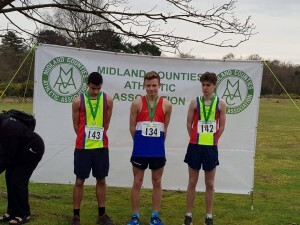 The biggest club haul of Midlands medals (so far!) 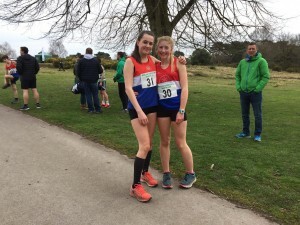 took place on Saturday 23rd March 2019 at Sutton Park where we won individual and Team medals galore. 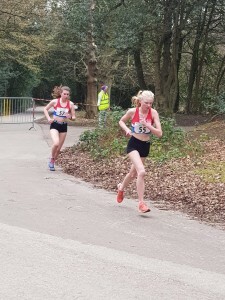 Competing against the rest of the Midlands Area over the undulating 5km Sutton Park course we had athletes in all three age groups U/13, U/15 and U/17 for both Girls and Boys. 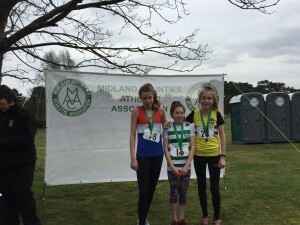 Our U/13 Girls were lead home by Molly Ibbs who claimed individual Silver in a time of 21:28, with Mathilde Wakefield finishing in 5th (22:52), Lucy Brownsword finishing 12th (24:05) and Beatrice Wakefield finished 15th in 24:37. Our girls were Champions scoring 19 points and gaining team gold by just one point! Congratulations to all our team. 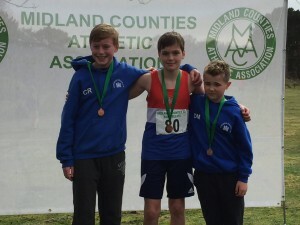 Our U/13 Boys were brought in by Charlie Ranford who finished in 8th (19:48), next in was Dylan Marchant in 16th (21:31) closely followed by Joe Stevens in 17th (21:39). The points score of 41 was enough to secure the boys a Midlands Team Bronze. Well done Boys! We had two athletes in the U/15 Girls race, with Poppy Ranford coming in 8th in a time of 21.47 and Lily Stevens finishing in 14th with a time of 23:20. Well done to you both. Our three athletes in the U/15 Boys finished as a team in 6th position, with Louis Wakefield finishing 12th (18.27), Tyler Davison was 23rd (20.37 and Matthew Morgan Bourne was 25th (20.54). Well done to you all. Our U/17 women were dominant in their race, and with all four of our athletes in the first 7 positions, comprehensively won Team Gold. 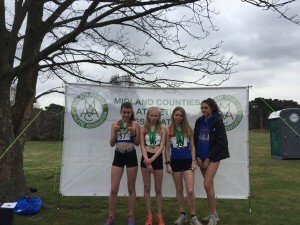 Individually we also did a clean sweep of the medals with Elizabeth Clarkson finishing 1st in 19:24, Nadine Tomkinson was 2nd in 19:51, Misha Twardochleb was 3rd in 20:02 and Scarlett Cotton was 7th in 22:14. A Fantastic team performance, Congratulations to all our team. In the U/17 Mens race Lewis Nagington ran a good tactical race was a clear winner, with a Gold medal performance of 16:40. Lewis won by a 27 second margin. Elliot Smith was also in the race but suffered the extreme misfortune early on of being tripped from behind. After such a heavy fall and following a trip to A&E he was given the all clear apart from mild concussion. Get well soon Elliot. Congratulations Lewis on your victory.